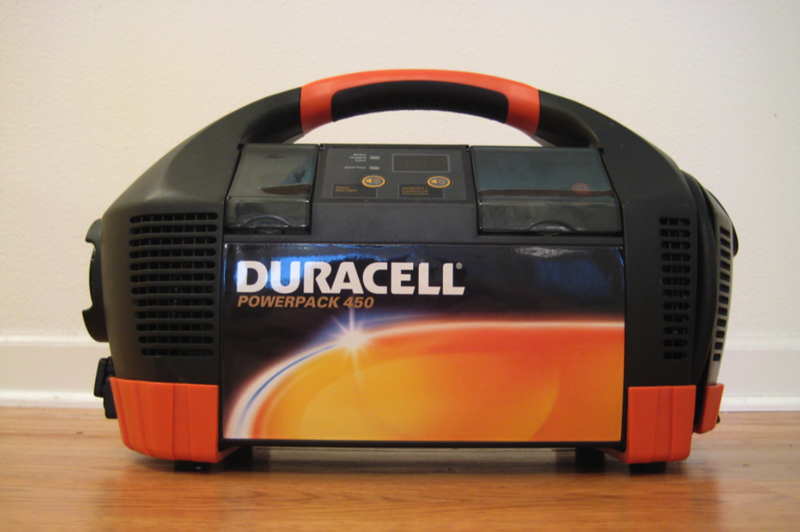 The Gadget: Duracell's Powerpack 450 is a portable power source for AC, DC and USB-powered electronics. It also features a vehicle jump starter, air compressor, flashlight and a voice feature. The Verdict: As a portable power source, the Powerpack 450 is outstanding. It cranks out 340W continuous (450W peak) of AC juice, which is enough to power laptops, lamps, radios, cellphones and other small appliances. It would be an ideal supplement to a generator in the event of a power outage. As far as a vehicles are concerned, the 150 psi air compressor works, but don't expect to be back up an running in a short amount of time. I actually have a slow leak on my front passenger side, and it can take over 10 minutes to pump up a flat (depending on the situation). I never ran into a situation where a jump start was necessary, but I don't see any reason why it wouldn't work. Duracell even supplies the cables with the battery. The 5W flashlight is fairly standard, but given the fact that the entire battery weighs around 20 pounds, its no substitute for even a cheap handheld version. However, if you are stuck on the side of the road in the dark, it could come in handy. On the downside, the Powerpack 450 takes nearly 40 hours to charge completely and the voice feature can be extremely annoying at times. I can tell you that my laptop maintained a full charge for nearly 8 hours while plugged into the device, but I couldn't tell you precisely how long it would have lasted because the constant battery status updates towards the end proved too much to bear. Still, voice directions that notify you of battery status and guide you through a jump start / tire inflation can still be useful—although not particularly necessary.